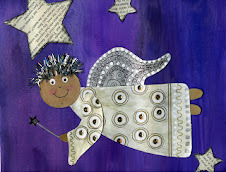 I have a thing for paperbag books.....I love creating them. On Wednesday I leave for the Fernie Writer's Conference where I'll be teaching 8-10 year olds how to make these books as well as lots of other projects combining the Visual Arts with writing. We start by painting the front and back cover. When you lay your book out flat you see both. Just be sure to remind the kids that the front cover is on the right. If they don't have the title figured out yet that's ok you can add it later. 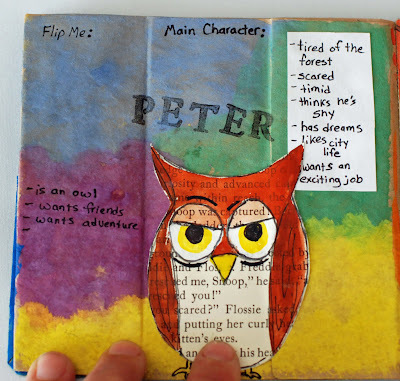 You also don't have to do this book in order........if the kids aren't sure what to put here we can always work on these pages later. The purpose of this paperbag book is to help the students organize and expand their ideas for writing their story. 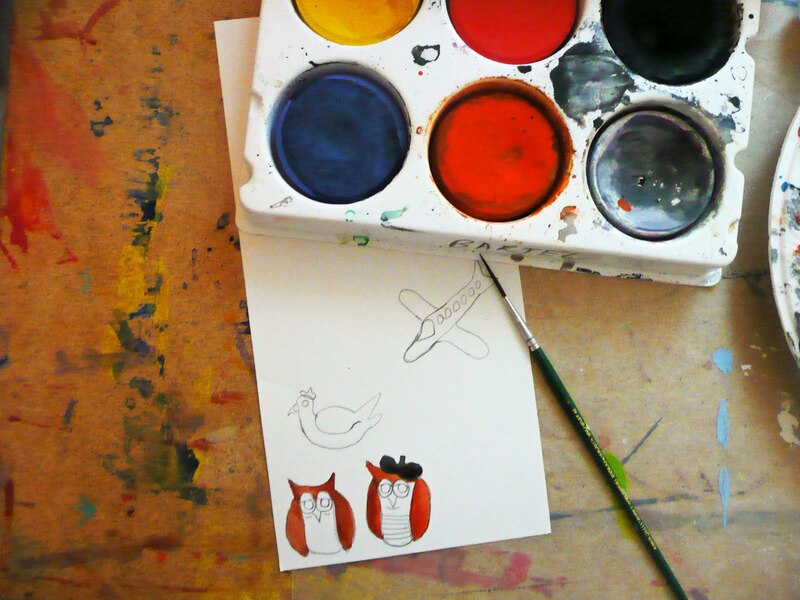 They also have to have a drawing, painting, or cartoon image of this character. 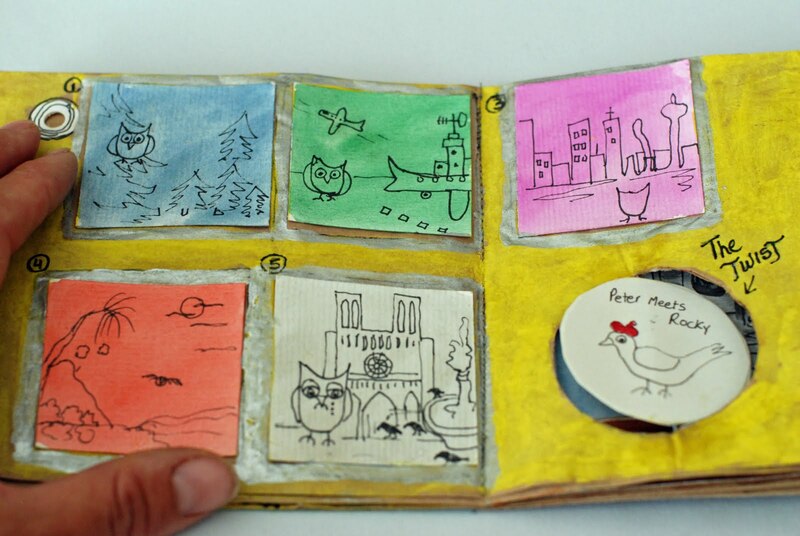 With the flap you can show the minor characters or where the main character ends up at the end of the story. 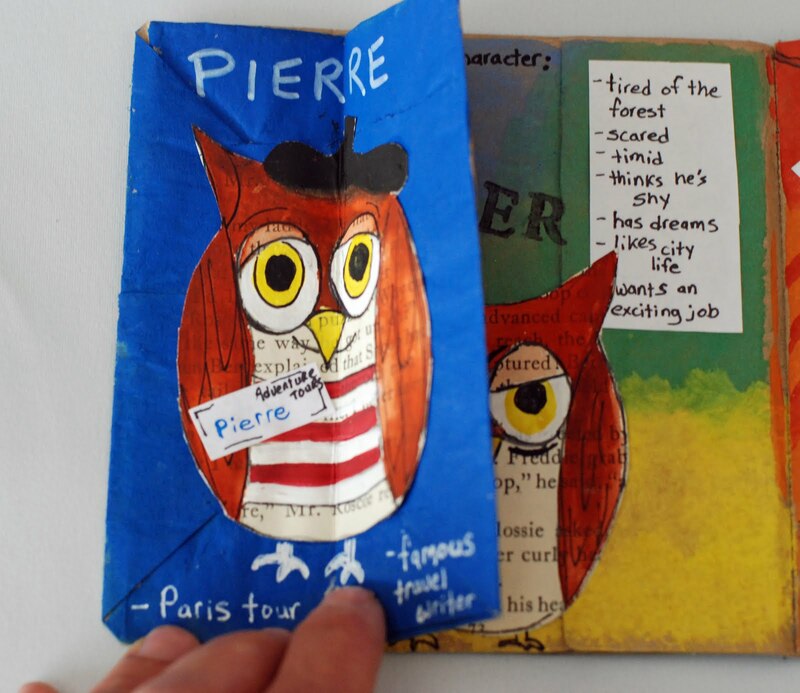 In my sample book my Peter the owl becomes Pierre the tour guide. On the 3rd page I included a spin wheel in the book. I used mine here to describe the different settings I want my character to visit during my story. I wasn't going to put a Fortune Teller into my story but I might want to incorporate it. 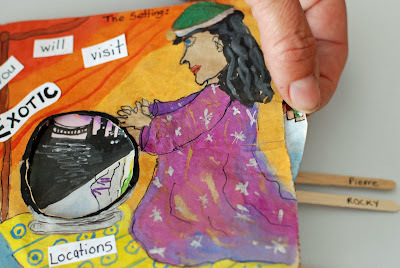 Other ideas for the wheel could be the character looking out a window, watching a T.V., staring at reflections in a pond........there are lots of possibilities. I just want the kids to have fun with it. I've made these wheels before (Color Wheel Gecko). 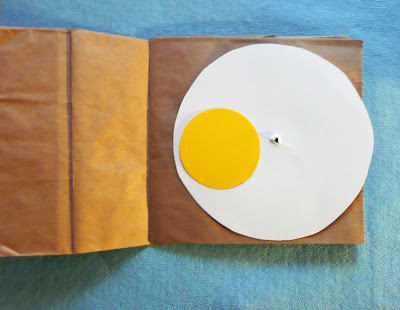 For the paperbag book I cut out a circle that is a little smaller than the page. I used a template and cut the circle out of posterboard. 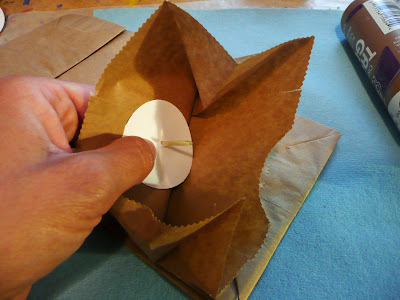 Punch a hole thru the center using an awl or knitting needle. I usually just eyeball the center but you can also draw 2 lines across the circle. Where they meet is the center. 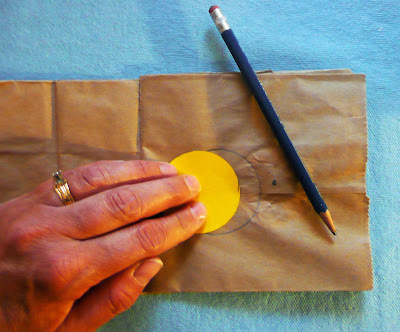 Lay the circle in place on the page (make sure it sticks out a little on the side) and make a pencil mark thru the hole onto the paperbag page. Cut a smaller circle, punch a hole and put in a paper fastener. 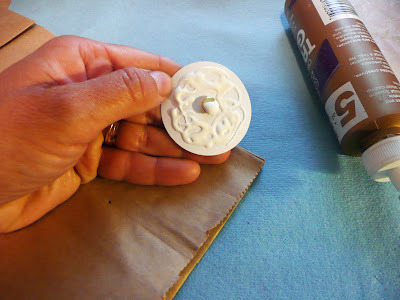 Put some white glue over the circle and top of the fastener. Open up the bag end on this page and place your gluey little circle inside. 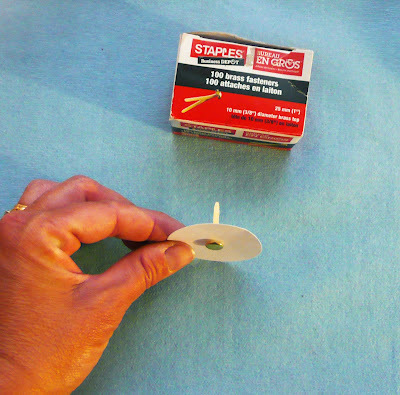 You want the top of the fastener to match up with your pencil mark you made on the outside. 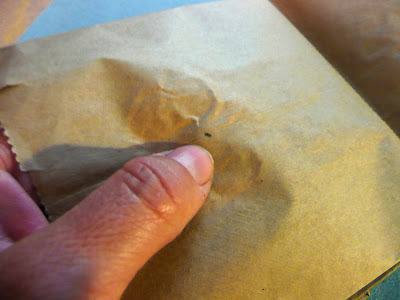 I can usually feel it thru the paper....adjust position of gluey circle if needed. Now you need to cut out your window. Here we are using a circle shape. Make sure your window shape is small enough to fit into you wheel. You want a bit of space around the center as well as a little on the side. Trace onto your paperbag page. Use the pencil mark of the center of the wheel as a guide for placement. 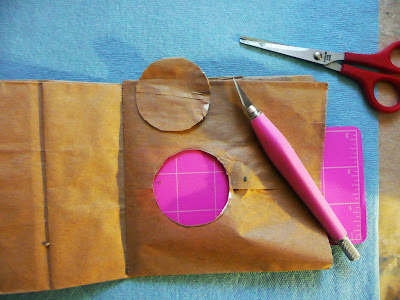 Cut out shape using paper cutter and scissors. 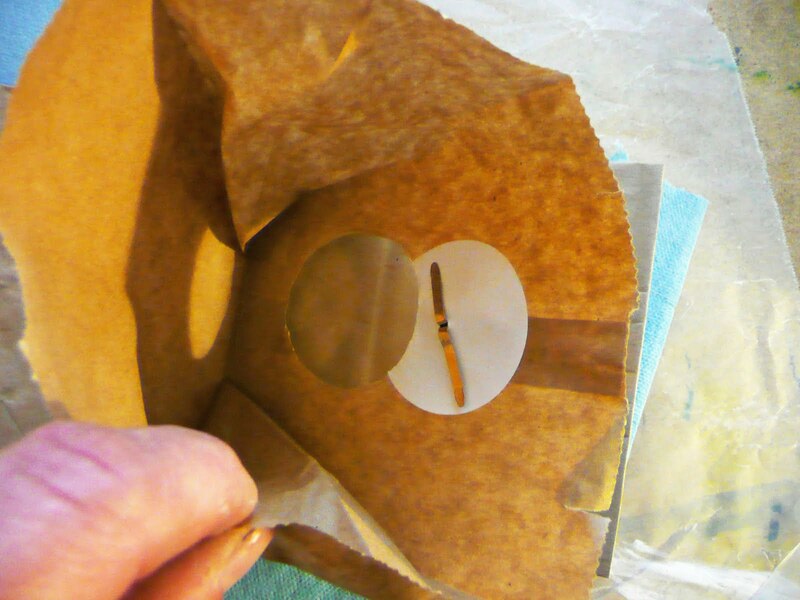 Make sure you only cut the top page not the sides of that bag. You'll be cutting away some of the little circle that's holding your fastener. That's OK. If the fastener prong is in the way of cutting just move it to the side. For the workshop I have done this all ahead of time for the kids. If you want you can cut a piece of transparency to cover the window. I cut them small enough to fit without covering the fastener. 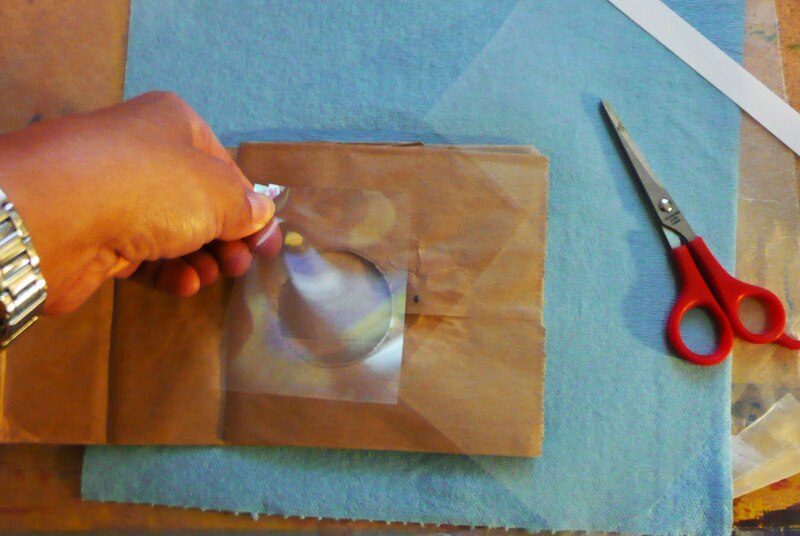 I then just open the bag portion and tape into place on the sides of the transparency. The kids will illustrate their scene and then the wheel. 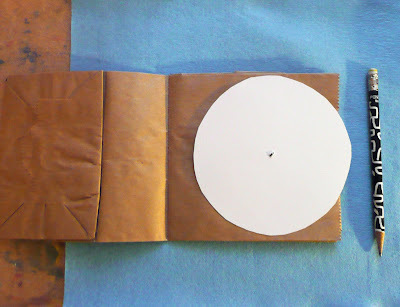 I divide the wheel up like a pie, each piece the size of the window shape. Place wheel on the fastener and you have spinner which changes the scene thru the window. The next 2 pages of the book use little inchie squares and incorporate a storyboard idea to help the kids sequence their plot. It also includes a little spinner for the twist. I go through the directions for the spinner in this POST. 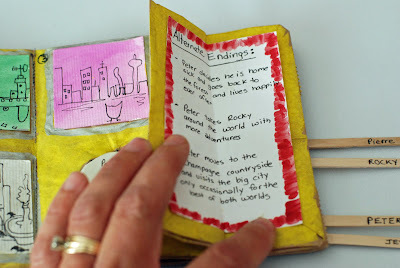 I used the flap on this page to write out some alternate endings or you could map out some other possibilities for your story. 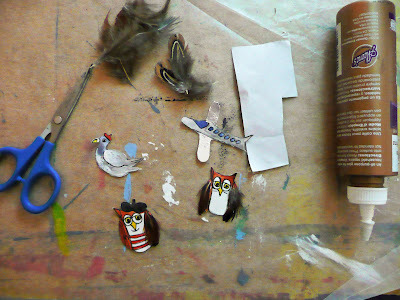 On the last pocket page I've made a puppet theater. This will give the kids a way the can act out their story trying different dialogue or sequencing. I know my 8 yr. old gets a lot of good practice in storytelling by having to put on a puppet show. 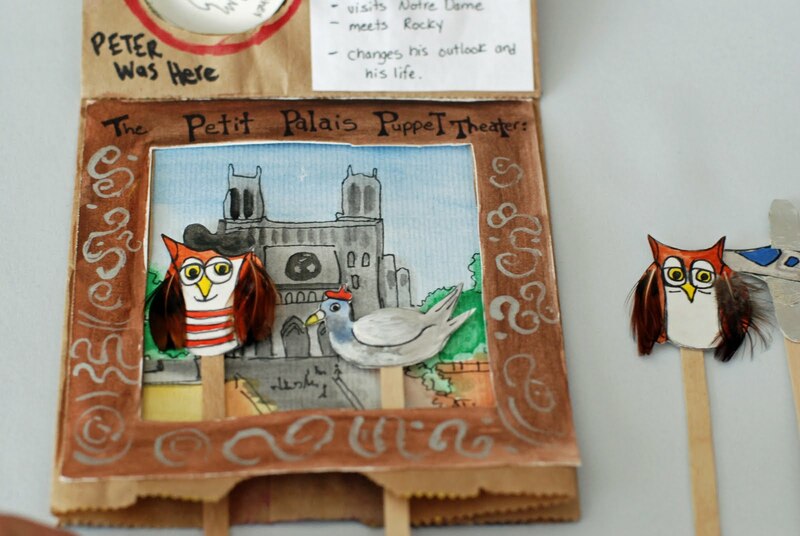 To make the puppet theater trace out a square shape for your theater that is smaller than the page. 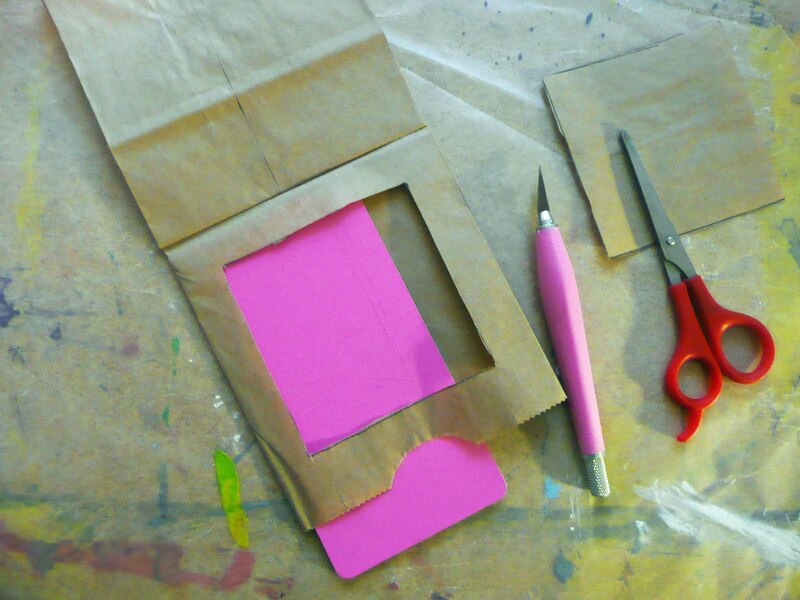 Cut out the square with scissors or paper cutter taking care to only cut the top page and not the sides of the bag. 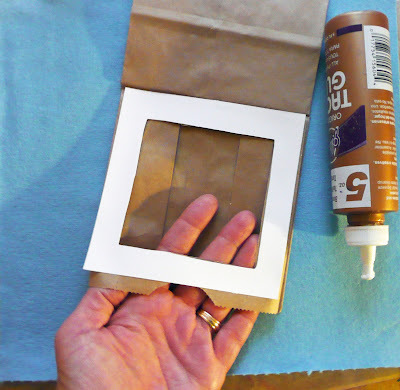 Now you could just leave it like that but I want it to be a little more durable for the kids so I cut out a frame for the theater from watercolor paper and then glued this into place. We then make our puppets. 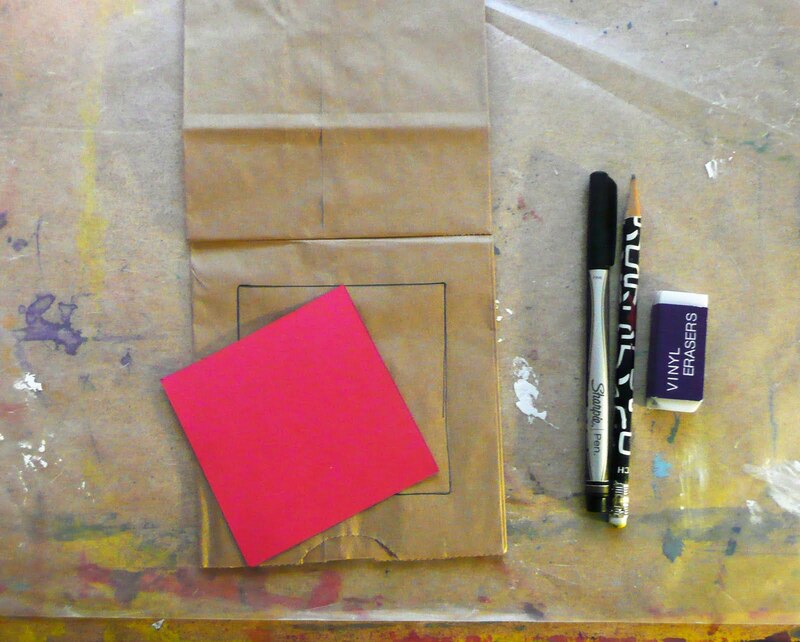 Paint or draw out your characters onto posterboard and cut out. I get the kids to add some embellishments to their puppets for a little WOW factor. 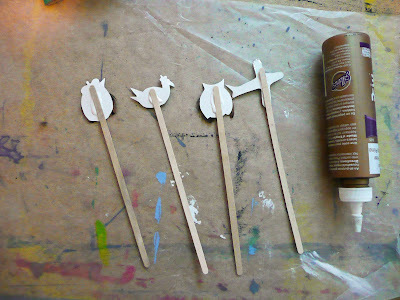 The puppets are then glued on to wooden coffee stir sticks (Dollar Store). Let dry. For the backgrounds I precut some wc paper that fits into the pocket. 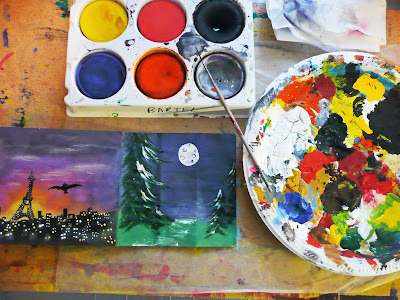 the kids then paint the different settings. Let dry and then store in the pocket. These switch out quite easily. 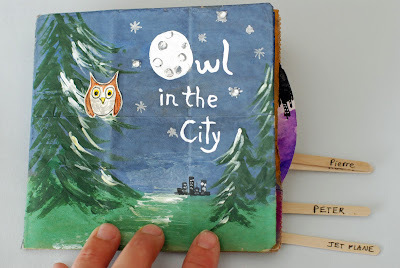 The pocket is also where you store your puppets. 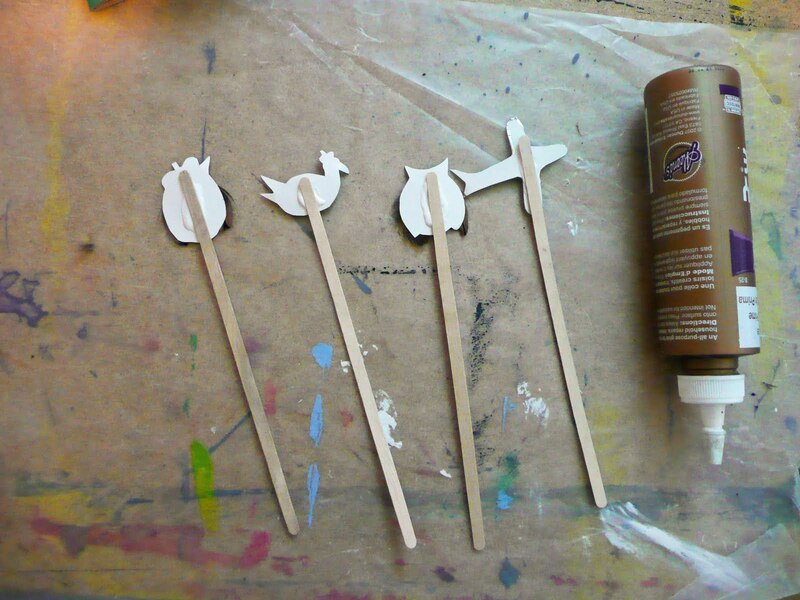 You can label the end of each stick to keep your puppets organized for the show. That's it. I can't wait to see what ideas the kids have for their paperbag books. I'm hoping to post the results as well as some of the other projects we will be working on. See from Fernie next time! What a wonderful idea!!! 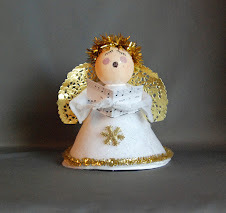 I've got to make one with my kids before the summer is over! 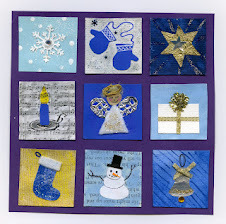 Thanks for sharing this great idea! Thank you for all of the pictures showing us how and what to do! Wow. What a fancy project! I was just popping in here to look again at your instructions for glue batiking and discovered that you were just in 'my neighborhood'! We're only about a little over an hour south of Fernie, across the border. 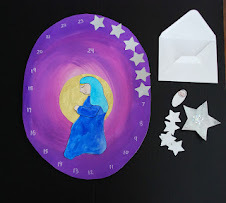 Have you done a similar course (with older kids, possibly) before this? I remember seeing similar handmade books at the Arts Station sometime in the past few years. 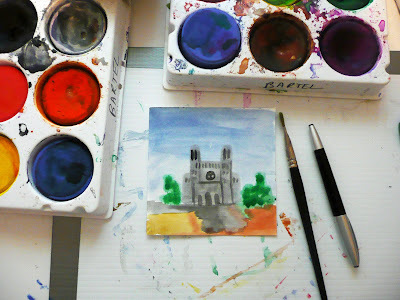 I've been known to drive my kids all the way up there for swimming lessons, so I'd certainly consider making the drive for them to take one of your workshops some time in the future, too. This is wonderful!! I will be keeping this in mind when I am teaching! Can I just say that you are amazing and I wish I had you for my art teacher as a child. I am so inspired just looking though your posts. I found you on Pinterest and have recommended your site to others there! 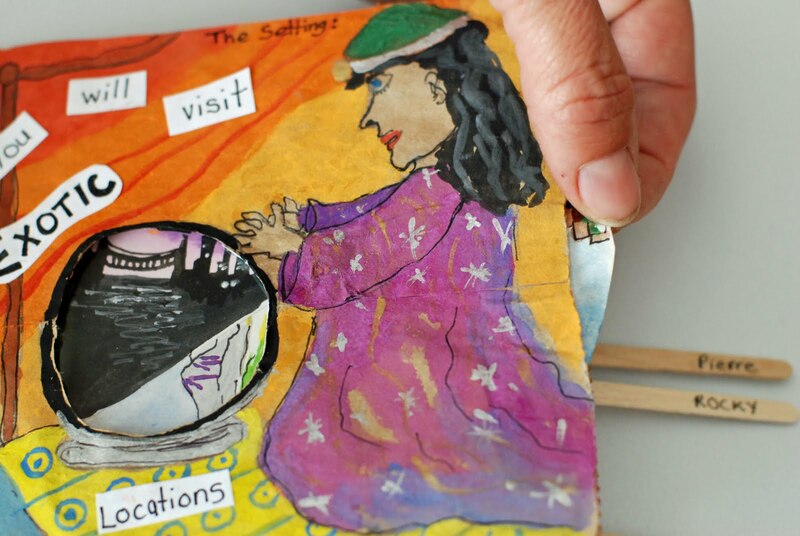 Thank you for sharing your art projects with us! Great idea to get students to write. 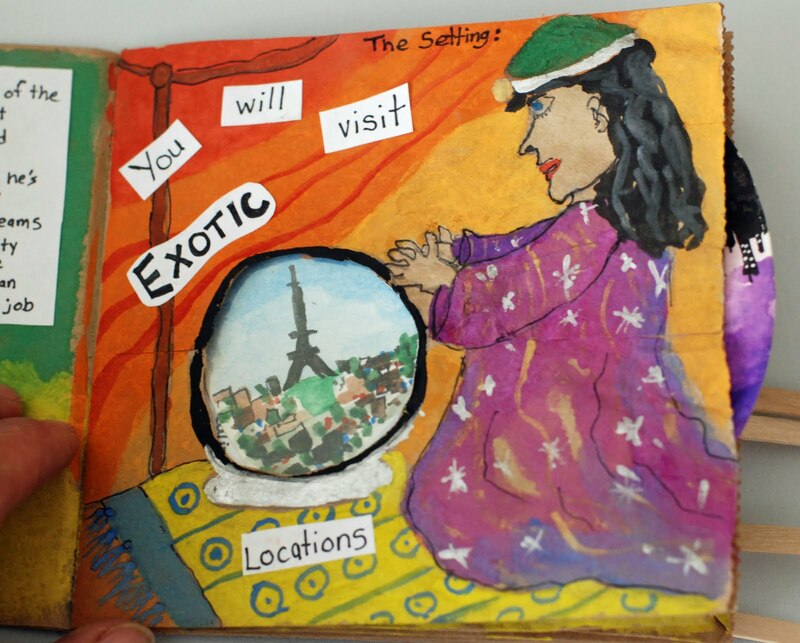 I love the pictures to help us to visualize.